IDB restore with Data Protector 8 and later is really straight forward. It allows a much more granular recovery than in previous versions, since it’s done using a fully featured module instead of a file system hot-backup. You’re able to restore the IDB (PostgreSQL database) including log file recovery, DCBF files and configuration files individually or all together in a one-step process. To be able to recovery, you need a valid backup first. Regular IDB backups are strongly recommended and can be created at any given time without interrupting backup operation. 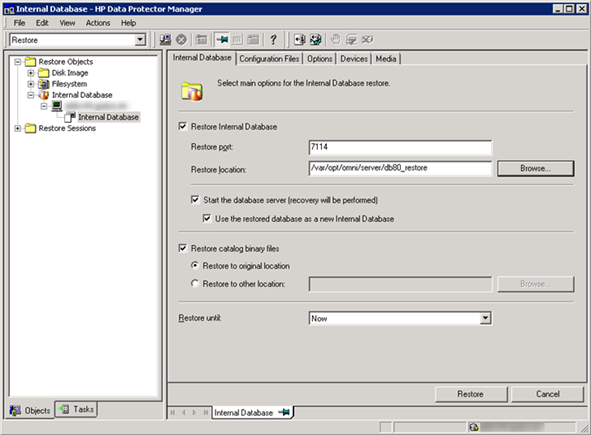 On a Linux Cell Manager the Internal Database is located in /var/opt/omni/server/db80. For this example I will restore the database to /var/opt/omni/server/db80_restore since it cannot be overwritten and all commands I’ll use later will refer to this path. If you need to adjust that, change the commands accordingly or make the changes manually using a text editor of your choice. Once the restore has been done, the Cell Manager will be up and operational. Just reconnect the GUI, since the IDB was switched during the process. Now it’s time to check if the restored version of the backup suits your needs. If everything is fine, we can start our clean up. Please note: The clean up is disruptive to the service (we need to bring down Data Protector services) and should be scheduled in a maintenance window. It is not required for operation after a recovery, but I recommend it. It removes stale files and directories from file system and make directory structure look like before the restore. It can be done immediately or weeks after the restore. Create a tarball of /etc/opt/omni and /var/opt/omni to allow fail-back. Move the restored database in the target directory and adjust symlinks. Please note: the name of the symlinks might vary on your Cell Manager. OB2BAR application on "linux.syncer.de" successfully started.